U.S. Spending On Global Health Has An Added Bonus At Home : Goats and Soda The Trump administration wants to cut the U.S. global health budget. A new study puts a different spin on the spending. A 50-cent meningitis vaccine. Kid-friendly malaria drugs. A vaccine to prevent a deadly diarrheal disease. These U.S.-funded global health innovations have saved millions of lives around the world. But they also come with an added bonus for Americans. The details are in a study released today by Global Health Technologies Coalition, an advocacy group, and Policy Cures Research of Australia, an independent research group. The researchers found that between 2007 and 2015, the U.S. government invested $14 billion in global health research and development. And that created 200,000 new American jobs and returned $33 billion to the U.S. economy. "While saving lives is a top priority, the economic argument — showing how it supports the U.S. — makes it stronger," says Jamie Bay Nishi, director of the Global Health Technologies Coalition. 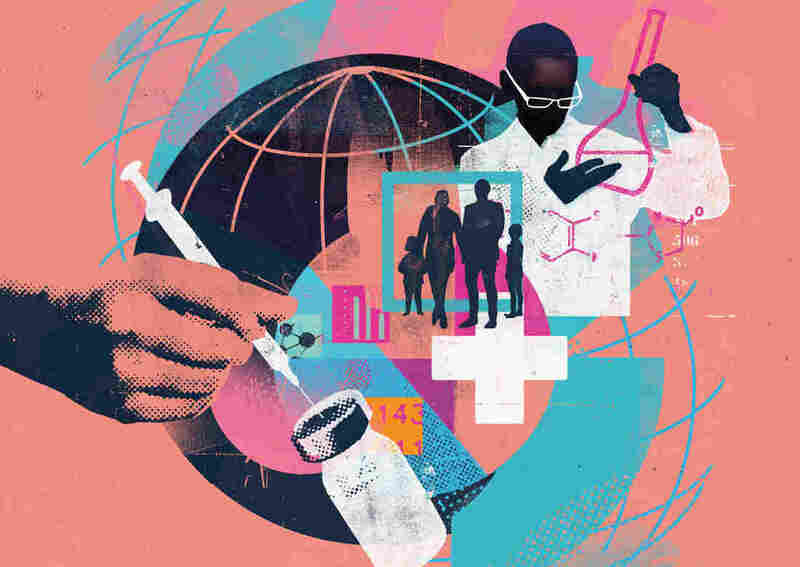 The hope is that the economic angle could help convince policymakers to protect U.S. funding for global health research, which has been declining over the past few years and now faces further cuts from the Trump administration. In March, President Donald Trump's budget director Mick Mulvaney told reporters: "The president said, specifically, hundreds of times ... 'I'm going to spend less money on people overseas and more money on people back home' and that's exactly what we're doing with this budget." The study puts a new spin on the spending. That's why this study is so important, says Jennifer Kates, vice president and director of global health and HIV policy at the Kaiser Family Foundation, a nonpartisan organization that focuses on the U.S. global health policy. "It actually provides data to back up that point: that this work is good for us at home." And while the dollars spent on global health and research are impressive — $1.7 billion in 2015 — they make up less than 1 percent of the U.S. budget. The funds go to U.S. agencies like the National Institutes of Health and USAID. According to the report, 89 cents of every government dollar put toward global health research is put right back into the U.S. economy. In 2015, that added up to $1.5 billion. Part of the money went toward hiring academics at universities and lab technicians and researchers at pharmaceutical and biotechnology companies, says Nishi. The report documents the impact of the spending. Since 2000, the funding has been used to create 42 new medical technologies like vaccines, medicines and diagnostics for people in low- and middle-income countries. But it's also been used to move forward some of the world's most ambitious health projects, like the Ebola and HIV/AIDS vaccines. And the government spending draws in more investments from the public and private sector, says Nishi. USAID's Saving Lives at Birth program for mothers and newborns, for example, started with a $20 million U.S. investment in 2011. Since then, it's brought in $110 million in additional funding from donors like the Bill and Melinda Gates Foundation and the British and Norwegian governments. Research funding also makes money for the U.S. in indirect ways. According to the report, the global polio vaccine, which the U.S. developed in the 1950s with a $26 million investment, has saved the government $180 billion in costs to treat Americans who would have been sick had they not been immunized. And MenAfriVac, a low-cost meningitis A vaccine, will have saved $9 billion in health care costs by 2020. The cost of developing it: $50 million. Advocacy groups across the global development sector are starting to use the economic angle to protect aid funding, too. In May, the U.S. Global Leadership Coalition sent a letter to Secretary of State Rex Tillerson urging him to protect the U.S. foreign aid budget because it's "critical to our economy and American jobs." The letter was signed by 225 business leaders from companies like Coca Cola and Procter & Gamble. And Friends of the Global Fight, the group that helps raise funds for The Global Fund To Fight AIDS, Tuberculosis and Malaria, has a big yellow button on the homepage of their website called "Benefits for America." Global health supporters hope that the approach works on Capitol Hill. "For some policymakers, it could be effective," says Kates. "It's not going to be the tipping point, but it's a helpful new data point."